March is here, and that means new Yu-Gi-Oh! releases. Players will be able to snag Star Pack – Battle Royal packs starting on March 10. 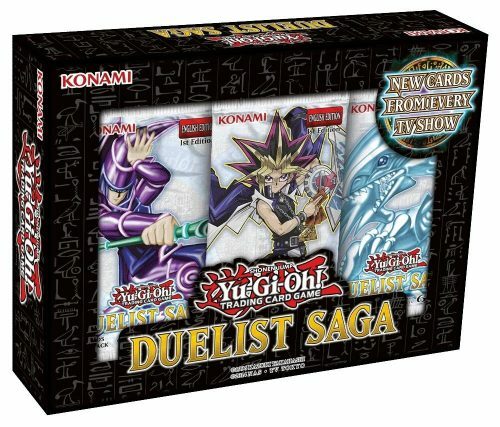 Star Pack – Battle Royal contains some of the most popular cards from the Yu-Gi-Oh! ARC-V animated TV series with cards like Fightfur Fusion, Yosenjus’ Secret Move, Bloom Diva the Melodious Choir, and more. Each pack contains three random cards from a set of 50 cards, 49 of which are available as Commons and 1 Starfoil only card (all 49 Commons are also available as Starfoils). MSRP: $0.99 per pack. On March 17, Raging Tempest Special Edition will be released. Following up on the January release of the Raging Tempest booster set, the Special Edition brings Zoodiacs, Shinobirds, and Windwitches back for an with a vengeance. Included are cards like Zoodiac Ratpier, That Grass Looks Greener, and Sea Monster of Theseus inside the three booster packs of Raging Tempest. One of two Super Rare Cards from the upcoming Maximum Crisis booster set, either Zoodiac Kataroost or Baobaboon, plus one of two variant Super Rare Cards, either Number 22: Zombiestein or Masked HERO Blast are also included in the box. MSRP: $9.99 per box. Secret histories and ancient powers are revealed on March 31 with Duelist Saga. It’s a 100-card set, all using a new, different Ultra Rare technology, features cards from all five incarnations of Yu-Gi-Oh! Out of the 100 cards there are 40 new cards taken from the manga series, the animated series, and cards inspired by some of the coolest monsters.